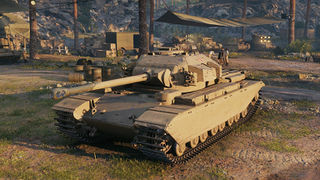 The FV201 (A45) is a British tier 7 premium heavy tank. Developed starting in 1944 by English Electric as a possible replacement for the A43 Black Prince. Some components were unified with the A41 Centurion. In 1948 trials of a prototype were started. The prototype mounted a Centurion Mk. II turret and a 17-pounder gun. Due to changes in Armored Forces policy and doctrine, development proceeded no further. However, the design later served as a basis for several post-war heavy tanks. 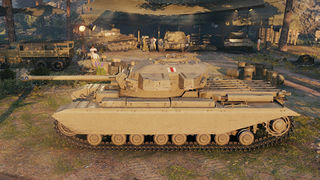 The FV 201 has a fairly strong frontal turret, which follows the trend of the Caernarvon and the Centurions. The gun, however, is a similar but less accurate version of the gun that is mounted on the TOG II. With 171 mm of penetration and 150 damage, It is tied for the lowest penetration of any tier 7 HT. The hull armor is weak, though the side skirts, fortunately, add a few extra mm of armor. The turret area above the gun is very weak and can be easily penetrated. This can be prevented by angling the turret to the side, turning it into an auto-bounce zone. The rear and engine deck are easily penetrated. Unfortunately, the fact that the gun relies on a high rate of fire, rather than alpha damage, makes this a difficult tactic to sustain and the turret remains vulnerable to high explosive shells. The mobility is slightly below average for a T7 heavy tank. It has a slower kph forward than the average, but a faster reverse, at 31 and 16 kph respectively. Terrain resistance is slightly worse than the tier average. An interesting side effect of the slower speed makes the aiming circle minimally affected by movement. It will be advised to utilize this attribute to your advantage, and firing on the move is a viable tactical option. The main problem with the A45 is that the 17 pounder is simply the wrong gun for this kind of vehicle. Its low alpha damage requires the A45 to stay exposed for long period of time in order to do significant damage, relying on out-DPM-in the enemy, rather than trading shots. Unlike the Black Prince, which has the necessary armor to weather the return fire, the A45 will not survive this. Nor does the A45 have the manoeuvrability to flank its opponents. As a result, the A45 often does better in matches where it is not top tier and therefore does not need to carry the game. It can be an effective support tank, provided it can stay hidden while firing. The British heavy and medium tanks received numerous buffs in 2017, but the A45 was left out, even though it arguably needed to be buffed more than any other tank in the British tech tree. Premium tank, no research required. The chassis was from the A45 Infantry Support Tank, which project was started in 1944 shortly after that of the A41 Centurion. After the war, the project was relocated to that of the "Universal Tank" design of the FV 200 series. The 200 series was to have used a common hull for all uses (self-propelled artillery, armoured personnel carrier, three varieties of tank, etc.). One tank type was to be the heavy FV 201 of 55 tonnes, armed with an 83.4 mm gun. In 1949, it was decided to bring the armament up to 120 mm. 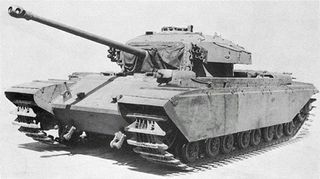 As this delayed the project, in 1952 the FV 201 hull was combined with a 17 pounder-armed Centurion Mk 2 turret to give the FV 221 Caernarvon Mark I. Twenty-one were built with the Mk III 20 pounder turret as the Caernarvon Mk II. 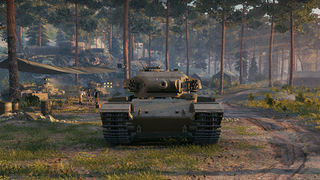 The FV 221 may originally have been intended to be the "Main Battle Tank" member of the FV 201 series, but with the success of the A41 Centurion such a vehicle was no longer required. In either event, the Caernarvon was only used for chassis development work serving in troop trials. In 1955, the first Conqueror was produced. Twenty Mark 1 and 165 Mark 2 Conquerors were built, including conversions of Caernarvon MkIIs. Production continued until 1959. It lost much tactical relevance once the Centurion was upgraded to an L7 105 mm gun. This page was last modified on 30 July 2018, at 01:36. This page has been accessed 70,480 times.